it's been nearly 25 years since, when there was not the map one of the largest and most powerful States in the world, but we are not going to discuss the reasons for his disappearance, and will focus on such things as entertainment and recreation of Soviet citizens. For the younger generation of life in the USSR may seems boring, monotonous, and partly formalized state system. But still, people lived and rested. Went to theatres, panels and exhibitions, in parks, cinemas, houses of culture and clubs. Maybe the younger generation will surprise you, but in clubs! It was, of course, no night clubs as it is now, and the program there was limited to a certain time and dancing mostly, but it was a "cultural centres". So said then. In General, life went on as usual until the "BC". it was Very popular to visit the various parks of culture and rest or cinema. Where in the premises for the entertainment of walking or waiting for the movie viewers, sets the achievements of the then Soviet technology (slots). As a child, at the time, I well remember that visit to the cinema or just going to the Park it was accompanied by visiting these places with established and alluring devices of entertainment. There was no greater happiness than being in the hands of the ruble fines, and even more, to plunge into a naval battle, try shooting accuracy for hunting, to play skittles or feel like a racing driver behind the wheel of a sports car. This is for older children, and for the very young variety rocking cars, rockets, etc. we should also note the presence in movie theaters and parks, various cafes and lunchrooms, where, after a fun day we could eat ice cream, drink a milkshake, "to refuel" sparkling water, lemonade or Pepsi-Cola. For our happy childhood, thanks to his native country! 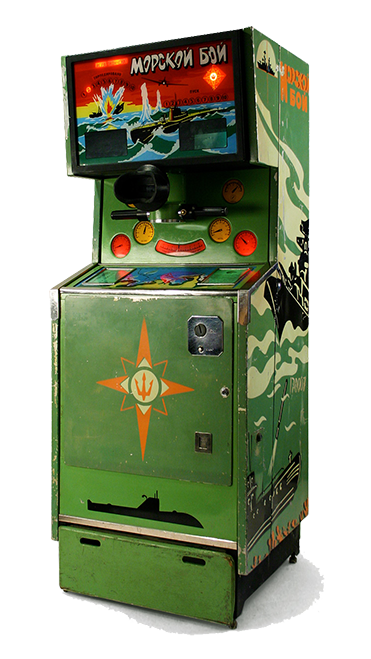 it would Seem that this time will never return, but being already in middle age, suddenly discovered, it turns out that the return is not, of course, at that time, but only in the atmosphere, thanks to a unique project called "Museum of Soviet arcade machines". It's so good! the Museum has not only slots, but the old Soviet vending machines with soda water or, more simply, soda. I remember now with a smile and the famous faceted glass, which was often absent in its place, because it is "rented" for filling is not soda. And for some reason not always returned to its place. In General, the former citizens of the USSR will be something to remember and the young to experience fully the Soviet era. the Company Hi-Tech Home recommend our guests renting apartments for rent to visit this Museum. Location: St. Petersburg, Konyushennaya square, building 2, Litera V.